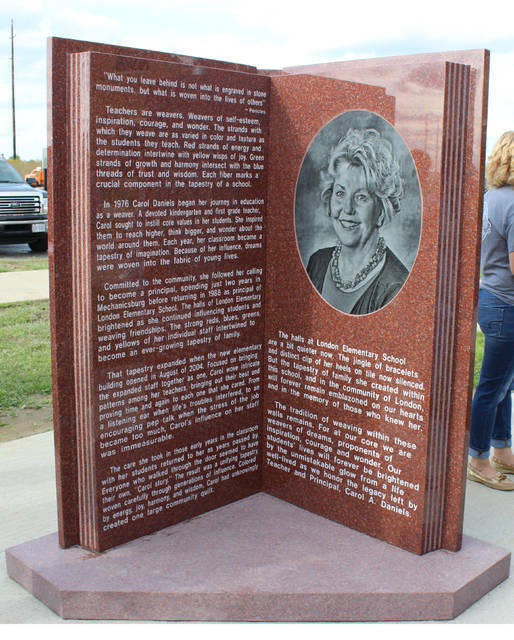 The Carol Daniels Memorial Project monument was unveiled on Wednesday evening. The memorial dedicated to the long-time London Elementary School principal sits on the northwest corner of the school grounds. The 6 and-a-half monument is accompanied by a granite bench engraved with the epitaph “Carol’s Way.” The monument is a testament to the many years of dedication that Daniels gave to the school system. 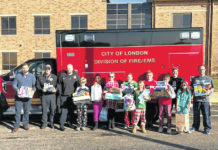 Family members, students (both past and present), teachers, school board members, administrators, and local officials crowded closely round to participate in the dedication of the Carol Daniels Memorial at London Elementary School Wednesday. After a week of gloom and heavy rains, the clouds rolled away and the sun shined down upon the crowd like the radiant smile of their old friend. 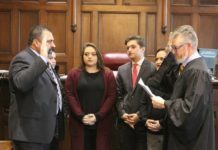 London City Schools Superintendent, Dr. Lou Kramer, welcomed the audience and Bonnie Hamilton, retired teacher and member of the group instrumental in initiating the design, funding, and construction of the monument, recognized family and special guests. Sheri Spahn, parent of former LES students and original member of the Carol Daniels Memorial group, spoke about the many positive qualities that made Daniels the person so loved by so many. After the opening presentation, the Daniels family cut the ceremonial ribbon encircling the piece. Representatives of the combined elementary and middle school choirs sang the original song “Here Inside of You,” with lyrics written by choir director Katie Bates and music written by friend Kary Dover, before the closing remarks given by second grade teacher Melinda Scott. Daniels impacted so many people in the forty plus years she was involved in the London school system that everyone has a Carol Daniels story. So many fine things were said in tribute that it is impossible to distill the love and admiration in which she is held down into one anecdote, but one in particular that resonates came up in casual conversation with Gloria Miller, a former substitute teacher that had worked under Daniels. Carol Daniels was indeed a woman who knew how to make lemonade when life handed out lemons.